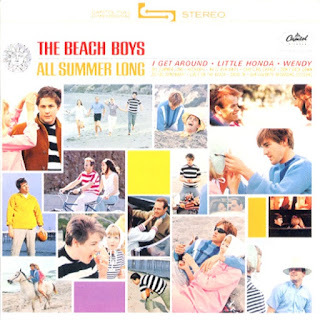 If I was making a playlist of my favorite summer songs, "All Summer Long" by The Beach Boys would be high on the list. This song was written in 1964 by Brian Wilson and Mike Love, and it's the title song of The Beach Boys' All Summer Long album. The harmonies are wonderful, and that is a xylophone you hear in the background, along with a piano. We've been having fun all summer long"
Do you like the Beach Boys? What is your favorite of their songs? I'd love to hear from you in the comments, below. Little Deuce Coup is my favorite!!! Also love their Christmas album! I love the Beach Boys' Christmas album -- it is so fun and retro! I really can't get enough of the Beach Boys. A beach boys CD was the first CD I ever bought, when I was like 6. So many happy songs. The Beach Boys were my first concert! I was probably 13ish and my family went as part of my Dad's work party. I equate the Beach Boys with summer. It has been a long time since I listened to them. Thanks all for stopping by! Beth, well said -- I equate the Beach Boys with summmer, too.